Rhine spent her whole life being protected by her twin brother from the Gatherers, but one mistake lands her in a van with a bunch of other young girls, waiting to see if they are chosen to be a bride. She doesn't want to be a bride - the idea of having no freedom and being forced to churn out as many babies as she can before the arrival of her twentieth birthday sickens her - but it's better than being shot and left for dead on the side of the road. Rhine is chosen and wakes up a couple of days later in a mansion, living on the same floor as the two new brides. So begins her new life. I had been anxiously waiting to get my hands on a copy of this book ever since I read the sneak peek at Simon & Schuster (link below) back in September. I finally received an ARC from a book tour on the day after Thanksgiving and promptly put down what I was reading to devour it. Wow, is this book fantastic! I had absurdly high hopes for Wither, and it now only met but exceeded my expectations. This is one of the best dystopians I have read in a long time. It's a little more psychological than action-packed, but DeStefano still manages to pack in twists and turns around every corner. 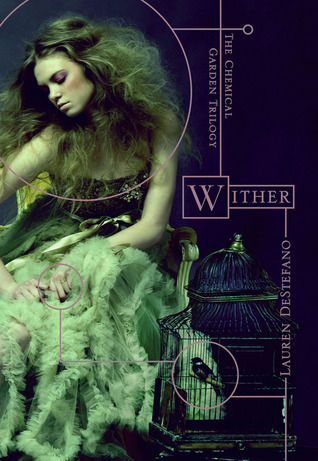 If you like dystopian novels or books with understated social commentary, Wither is the book for you! You can get a sneak peek at the first chapter of Wither here. Book 2 of the Chemical Garden trilogy will be released in spring 2012. Loved this book - and I can't wait for Book 2! Not to mention that I really love the cover - soooo pretty! :) The characters really came to life, and it was hard to let some of them go at the end!